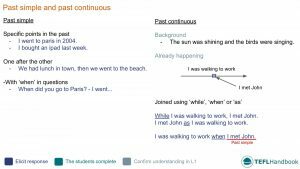 An A2 level ESL lesson plan for teaching the past simple and past continuous. It includes a suggested lead-in activity, several classroom activities, a game and a collection of specially selected ESL resources from around the web. The best way to view this content is through the TEFL Handbook app. So if you have an Android device, be sure to check it out. 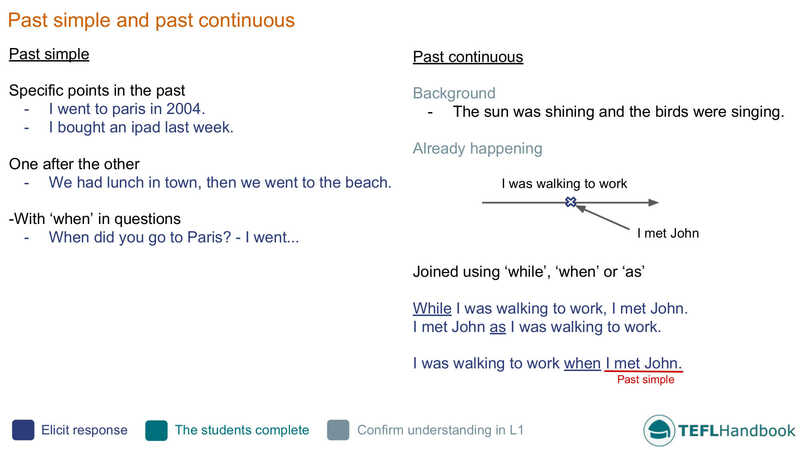 Students at this level should already be familiar with the past simple and past continuous. The point of the board work below is to highlight the functional uses for each. The colour-coded text indicates which parts you should be attempting to elicit. A fun and challenging ESL group activity to get your students thinking about how to use the past simple and past continuous together in a natural way. Tell the students they are going to write a newspaper report about an event. Elicit the type of event from the students (Natural disaster, bank robbery, alien invasion etc.). For strong classes, try to elicit the kind of information that they'll need to write the article. Write questions on the board that you want the report to answer. The following should be sufficient: What was happening before the event? What were people doing? What happened? How did it begin? What was happening during the event? - People's reaction How did it end? What was happening after? Confirm the students understand each of the questions, elicit which tense should to answer it and then move on to the next activity. This ESL writing activity follows on from the previous exercise. In their groups, the students plan and write their stories. In their article, they should answer all of the questions from the board. For this final activity, the groups will swap books and analyse each other's work. Tell them that they should look for the answers to the questions from the board. Follow up with every group to find out whether or not all questions were answered. If there's enough time, have one student from each group read the story. Correct any mistakes you hear. Here are a couple of games that English teachers can use to practice the past simple and past continuous. As usual, our suggestions require the minimum of resources (whiteboard, markers and students). 1. Harry Potter and Justin Bieber were walking to Africa. 2. A small, sad pig sang a happy song. 3. Donald Trump climbed the Eiffel Tower. 4. A silly elephant was driving a giant car. 5. A hungry hippo flew to the moon. 6. A tired duck was eating a ham sandwich. Divide the sentence on the board into three parts. The subject, verb and object. This makes it easier for the students to organise their explanation. 2. Stole a penguin from the zoo. Now, select two students to be the suspects and each other's alibi. Inform them that they will have answer questions about what they were doing at the time of the crime. Before sending them away to get their story straight, elicit where they were at the time of the crime for all the class to hear (zoo, cinema, theme park, football match). Send the suspects off and instruct the rest of the class to come up with a list of questions that they will use to interrogate the suspects. You can help the students with their questions. Bring the first defendant back to answer the questions while their alibi either leaves the classroom or listens to some music. When the students have finished interrogating the first defendant, bring in their alibi. If the stories match, they are off the hook. If not, guilty. Our suggested next lesson is on using 'since' and 'for' with the present perfect. If you've found these materials useful, be sure to check out our full list of elementary ESL lesson plans, A2 Lower and A2 Upper. For other levels, have a look at our complete selection of EFL - ESL lesson plans. If you use an iOS or Android device, try out the TEFL Handbook app. An ESL lesson planner for English teachers. It has a lot more content and gives you faster access to our ESL resources, making it easier to use in class.